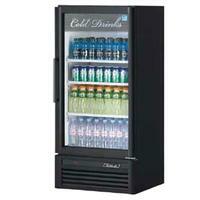 Turbo Air glass door merchandiser. Shadow Free Advertising Panel - Turbo Air is the pioneer in the refrigerator industry on applying special LED Light Guided Panels (LGP). LGP increases panel visibility and eliminates shadows, thus enhances any store atmosphere with eye-catching effects. Modern Design - By harmonizing curvature and rigidness, our modern style product designs are user-friendly while maintaining the highest product visibility and aesthetics. Door Opening Alarm - If the doors are not tightly closed, the refrigerator will not run. This would cause the cold air to escape through the opening, making food products spoil inside the cabinet. To prevent this problem, our refrigerators are equipped with the Door Alarm System that will sound if the doors are left open for more than 30 seconds. Greeting Sound System - Sound system plays music and recorded greeting when customer opens the doors. contents may have already spoiled. To eliminate this, Turbo Air units have a warning system in place that diagnoses and monitors itself for risk factors, which gives an early warning signal in the form of an audible alarm to eliminate product loss and future service issues. Triple Pane Air Insulated Layer Glass Doors - Equipped with unique triple pane glass doors with a layer of patented, transparent thermal insulating film applied between the glass layers. Lightweight door construction reduces door maintenance and bushing wear, and facilitates smooth door opening. Digital Temperature Control System - Digital technology provides precise and constant temperatures throughout the cabinet. This allows food products to remain fresh over an extended period of time.